The Chancellor’s Award is presented to those who have best demonstrated and been recognized for their integration of academic excellence with other aspects of their lives, such as leadership, campus involvement, athletics, career achievement, community service, or creative and performing arts. 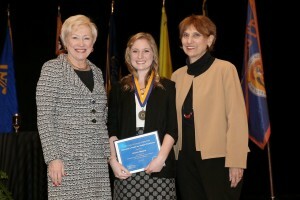 Kristin Bonura is a member of Sigma ThetaTau, has received President’s and Dean’s lists honors, has been active on the Student Nursing Association, and has completed missions to Guyana to work in remote areas to provide medical assistance. She currently works in the Huntington Hospital Emergency Department and is involved in the Nursing Honor Society and other peer mentor nursing programs. 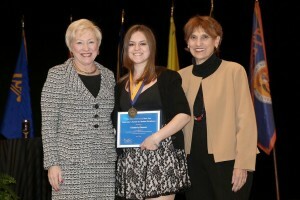 Kimberly Gleason has received President’s and Dean’s lists honors and served as treasurer of the Psychology Club. She also served as a leader in Psi Chi and the International Honor Society for Psychology. She maintained a 4.0 GPA during both semesters of 2014, and in the summer of 2015 was selected for Columbia University’s RA Program. 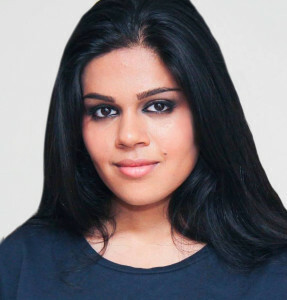 Kinza Nadeem Kasher has combined bioscience with her studies in visual communications. 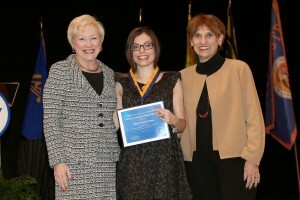 She has done extensive research on Multiple Sclerosis, held leadership roles on campus as a Rambassador, and had her work exhibited at the Babylon Arts Festival. Kinza has assisted Haitian immigrant families and maintains a GPA that keeps her on the Dean’s and President’s lists. State College in January 2014, which provides teddy bears to children in crisis worldwide. She studied abroad in Athens, was inducted into the Golden Key International Honor Society, received the Student Award for Academic Excellence, and was the valedictorian of her December 2015 graduating class. She also was a candidate for a Fulbright Scholarship/ Teaching Assistant in Greece. Alumni Dinner a Smashing Success!